Does anyone have any information about a manufacturer called Tidder? Recognition & characteristics? Dates? anything? 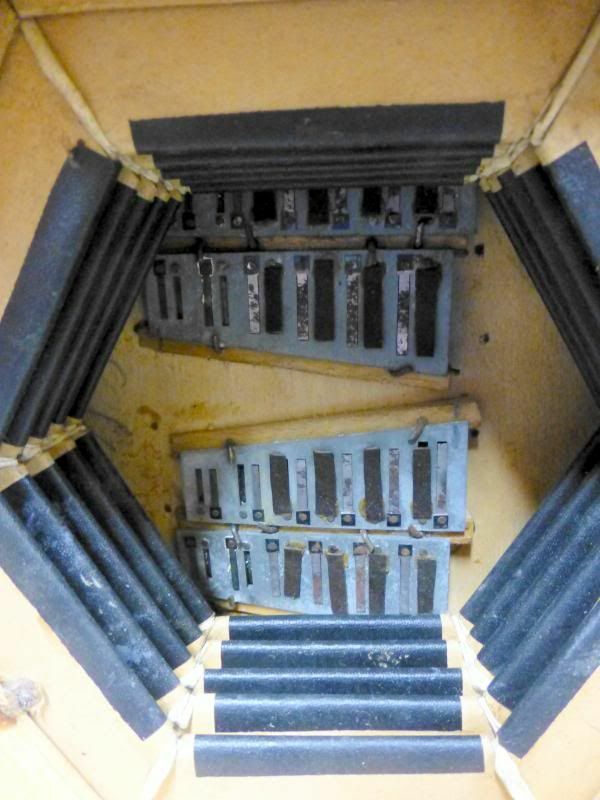 He was unheard of until I identified him,in 2005, as the probable maker of a few thousand "anonymous" concertinas. Pretty much all that is known about him is in the Help Confirming A Possible Lachenal thread. I have underlined the bit about the gussets as that is the defining characteristic that David Leese mentioned to me when I first tried to identify my concertina some time ago now. 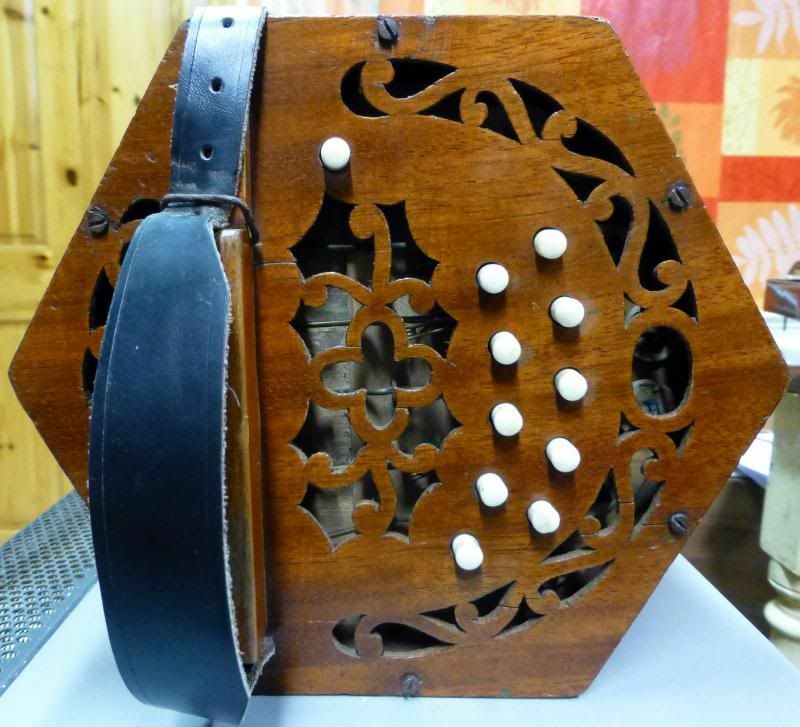 My concertina is a mahogany ended 48K English treble. 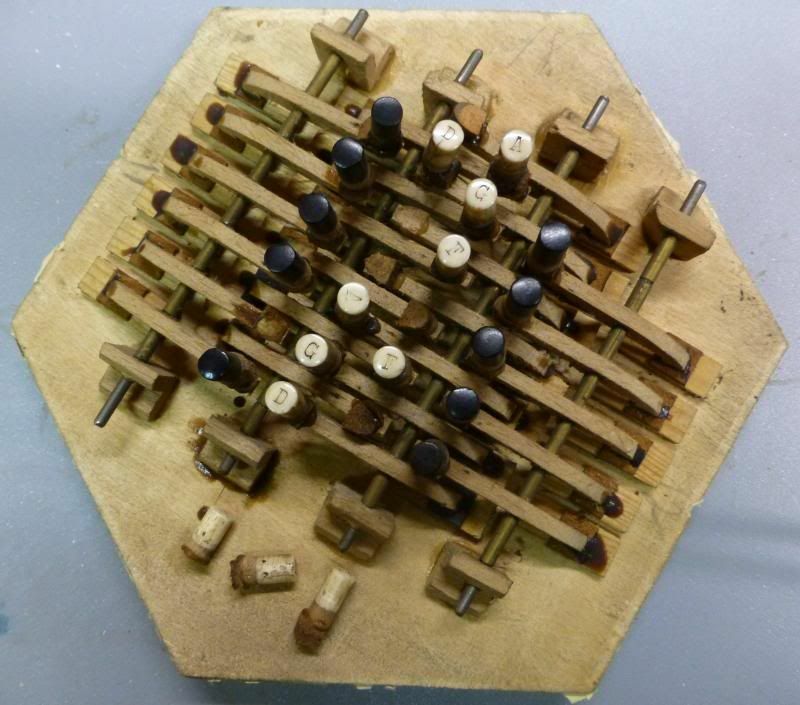 The weight and quality of the mahogany is very good, as is the delicacy of the fretting and the molding around the action box cover. The polish is also good deep and robust, not what one would associate with a basic mahogany ended Jones or Lachenal. 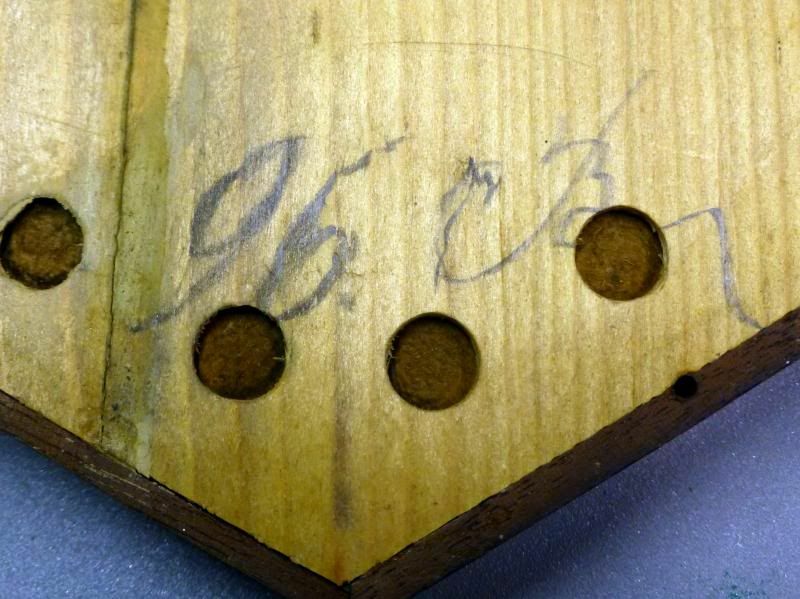 The reeds are a nickel alloy, the serial is 3459, and the number is not impressed into the wood, but is a surface stamping as you have described. 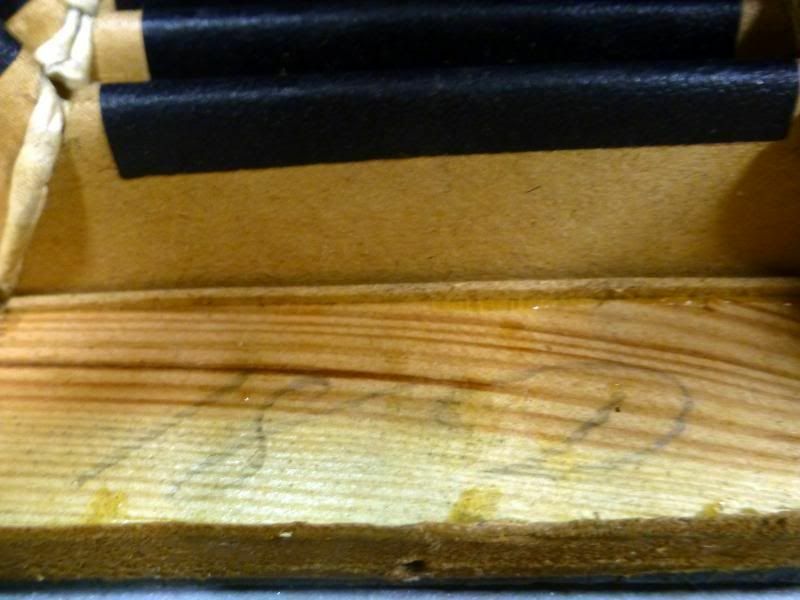 The reed pans seem to be a fruit-wood and are not 'green tinged'. 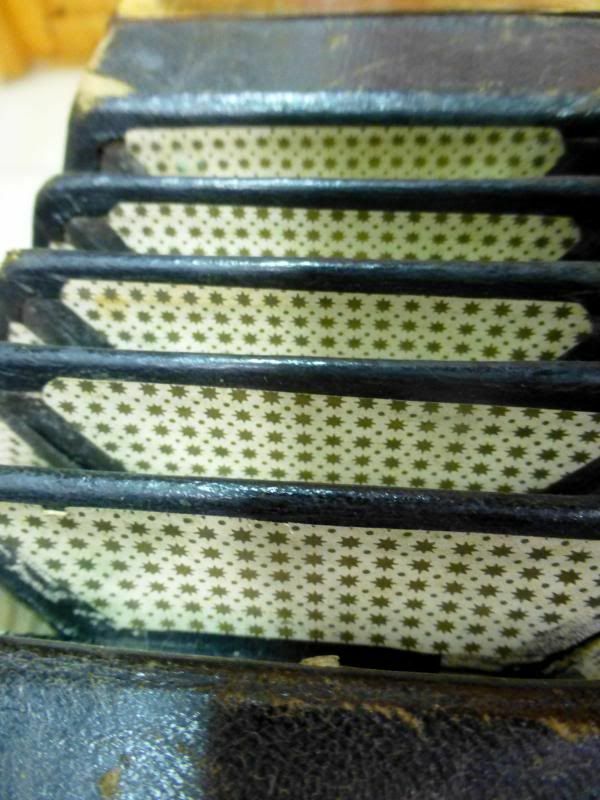 The bellows papers are, like those in the pictures in your earlier posting, showing a courser texture but the pattern is field of gold stars printed very nicely on white, not the common dot and cross pattern. 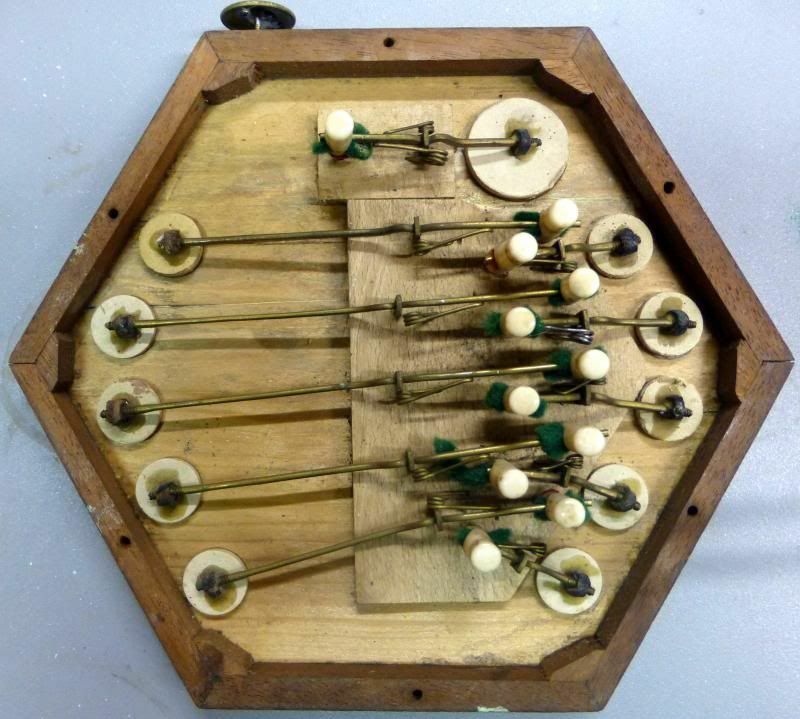 Another thing of note is that the reeds are in broader frames, not unlike the Jones pattern but the reed tongues are not so broad. The action is also significantly different, it is a hooked arm and aperture style, with the arms being made from slightly flattened brass rod, but with very large & sweeping curvatures. the pivot posts are very chunky, and the tops are rounded off, not square. William Henry Tidder b C1848, listed in Gellerrman's International Reed Organ Atlas as W H Tidder and later WH Tidder & Sons. Started making harmoniums, concertinas and Seraphines. 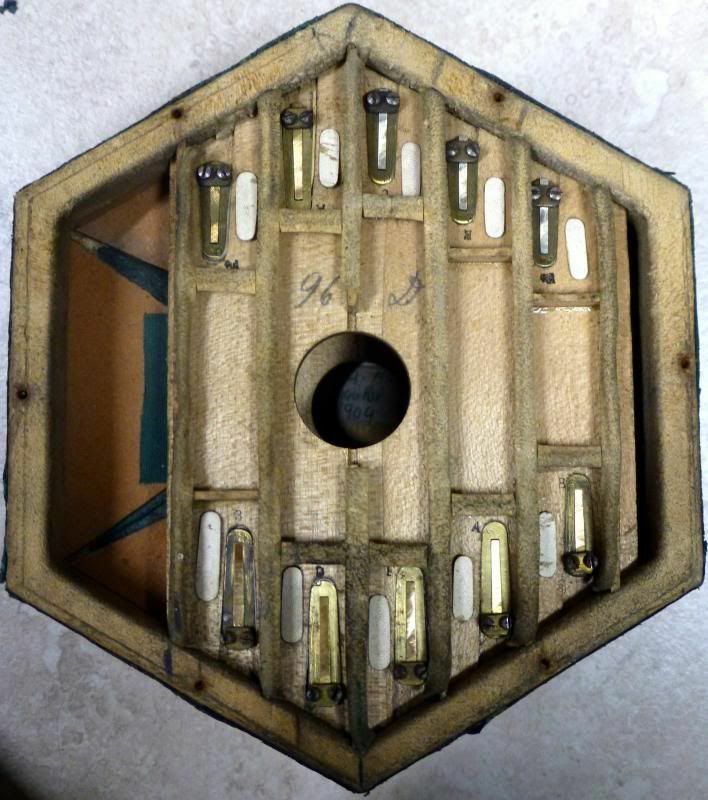 Married in 1871 to Louisa Ruth Hieney in Hackney and listed as a musical instrument maker on his marriage certificate. In about 1890 he lived at 553 Commercial Road (0.8 of a mile from Jones). It may be that he had some involvement with George Jones given this address. Tidder seems to have had instruments (reasonable quality I think) attributed to him when when not identified as by any other maker - something of a man of mystery!! I haven't seen any actions attributed to him either. It seems that we have a name 'W.H Tidder',and we have a group of concertinas which are clearly from a different stable to all the others, however the final and confirming link between the name and the instruments remains elusive. 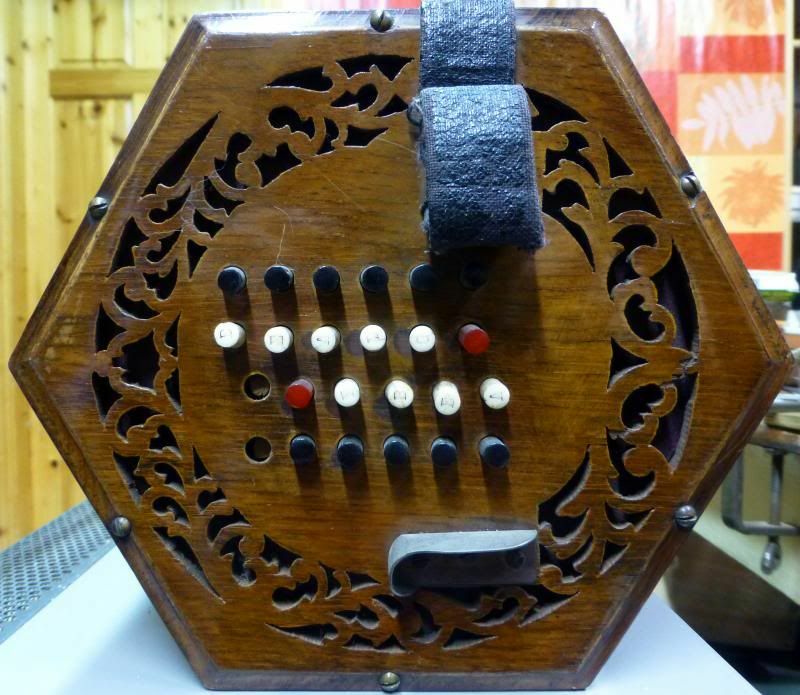 unless anyone else has a concertina with 'baggy' gussets and a label? Only about 2 lines from Gellerman the rest from ancestry.co.uk + a bit of guesswork!!! Ah, sorry, I misunderstood and thought Dave was quoting you quoting Robert Gellerman (who in that case seems to know no more about Tidder than he did in 1985, and did't mention concertinas at all) rather than yourself - I thought you must have a more recent edition of the Reed Organ Atlas than mine. Only, William HenryTidder (1847-1906) was born in Stepney, East London, on 21st May 1847, the son of tradesman (a gun maker), and married Louisa Ruth Hickey (1851-1926), the daughter of a mariner, on 26th December 1871 - so yet another Christmas marriage in the concertina trade, like John Crabb (1826-1903) and Emma Sarah Blunt (1827-1859) on Christmas Day 1847, his brother Charles Crabb (1835-1885) and Elizabeth Matilda Nichols (1833-1907), on Christmas Day 1855, and Charles' daughter Elizabeth Mary Crabb (1861-1921), who married her fellow concertina-maker, William Francis North (1857-1944), on Christmas Day 1879. I'm surprised to see In about 1890 he lived at 553 Commercial Road (0.8 of a mile from Jones) - because I have him at the same address (144, Jamaica St., Stepney) on both the 1881 and 1891 Censuses. tried to copy the entry - stupid microsoft machine and windows 8!!!!!!!!!!!!!!!!!!!!!!! The above quote from Google books - ran out of free preview!! maybe his home address? maybe two W H Tidders in the same locale?? I agree his wife's maiden name is Hickey - we, initially looked only at 'her' name and it looked like Hieney - looked at the K in Hackney realised it looked the same as the letter in her name! I wish all census takers had to prove they could write legibly!! I remember the hassle I had when chasing Joseph Scates through the census records - I only found the entry for 1871 by looking up Catherine Dickens and going back a page, even then, if you didn't know what you were looking at it wouldn't have read as 'Scates'. It was only when I noticed 'pianist' next to what just about looked like 'Linda' that I worked it out. Ah, so Robert Gellerman did find out some more about him, between editions. It would definitely be a huge help if Census enumerators, clergymen and other record keepers all wrote legibly, though (when searching online) it would also help if the people doing the indexing were familiar with local names and places. He must have taken voting seriously!! I have to thank you both for your efforts, a new chapter for the makers listing: WH Tidder revealed. do we have a tangible link between Mr. Tidder and these mystery instruments with the baggy gussets? I know your initial posting talks about 'probable', is that because WHT is the only known candidate, or do we have some other evidence? -distinctive bellows which have huge sticking-out gussets (Baggy) and a cheap version of Lachenal papers, one example with gold stars on white, ribbed paper. - Stamped inside with a rubber stamp and are 2000-3000 numbers, an example exists at 3459. Do you have any other link between this classification of instrument and WHT? My reasons are still as outlined initially in this post and a likely association with Jones, based on stylistic and geographical grounds. But bear in mind that it was not at all uncommon for instrument makers to build "for the trade" in Victorian times, rarely, if ever, putting their own names onto what they produced. For example, there are many unbranded (or dealer-stamped) 8-keyed timber flutes being played by Irish musicians, that have long been recognised as being of superior quality, which are stamped A.L under the keys, but nobody knew who that was until I realised it must be Alexander Liddle, and started telling people. In the intervening 35 years that has become accepted and a handful of examples have surfaced actually bearing his name, to confirm the attribution - maybe the same might happen wth Tidder yet? 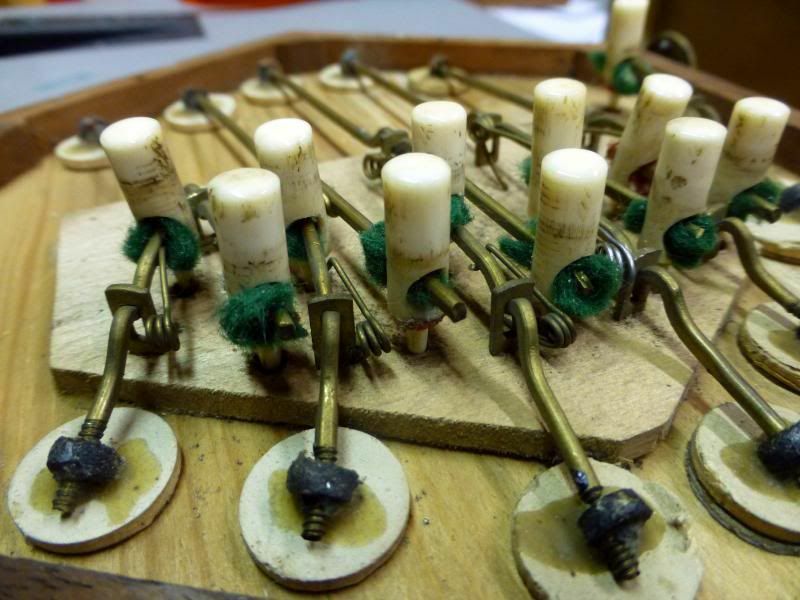 Judging by a 48-key English #5236 that's listed on eBay at the moment, we could well be looking at a production of more than 5,000 instruments, if the numbering is consecutive. Oh, and don't forget Wes Williams in all this - he'd already done research on Tidder's addresses. I must confess that when I first saw that one I thought it looked like a Schuster Theo, and I've said before that they do have similarities, though lots of makers used that Wheatstone-derived fretwork pattern - but this one has only 5-fold bellows and I think all the Shusters I've seen have 6-fold... But it's very hard to tell for sure from a photo anyway. But whatever it is, it's seriously overpriced - even with "25% off"! Do the Schusters have 4-digit numbers rubber-stamped inside them? (I can't remember, or maybe I never knew if they were numbered. ) Edited to add:For that matter, are the right and left sides marked R and L, in the English manner, or D and B, in the traditional German? 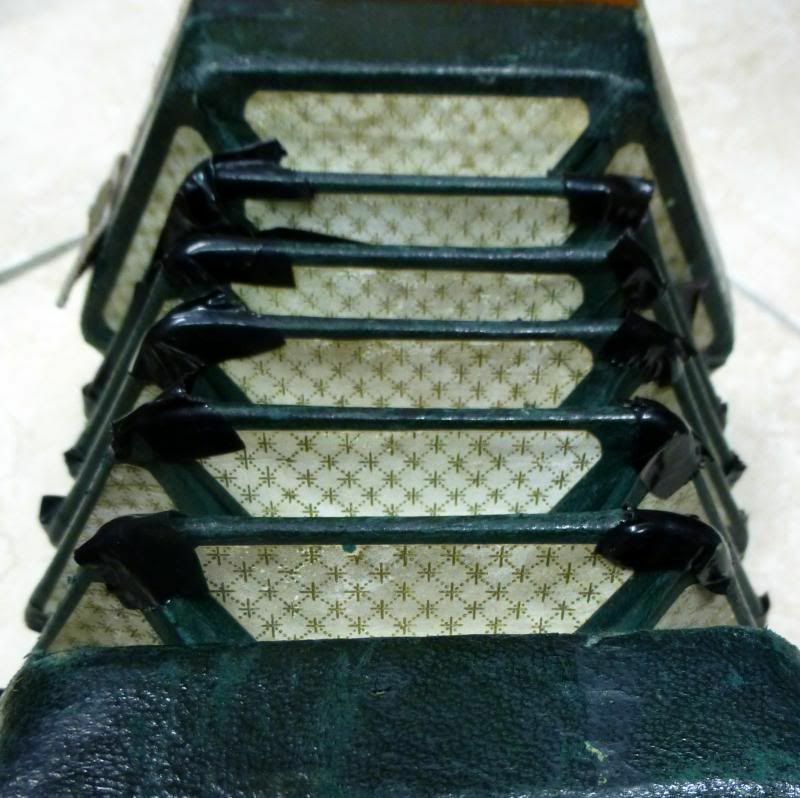 Does anybody have internal photos they could post, of the action, reedpans/reeds, of a Schuster and/or a "Tidder" English-system concertina, for comparison? 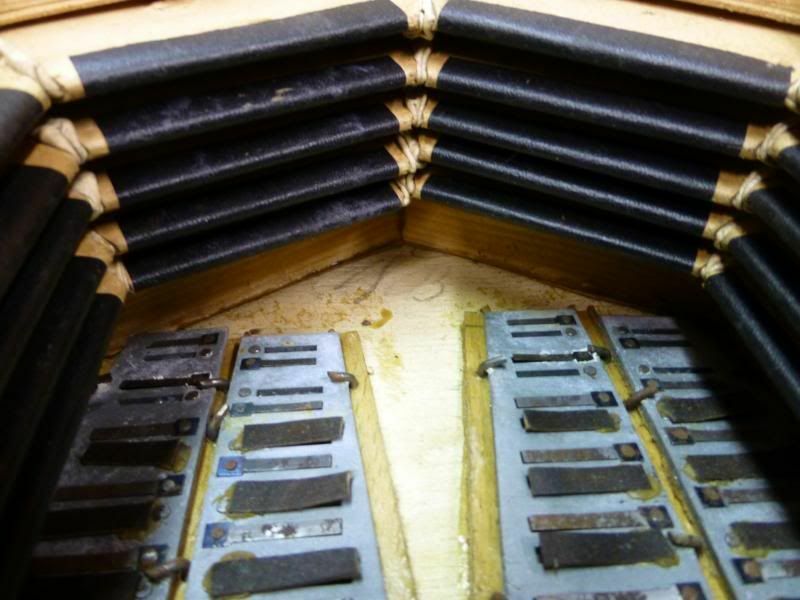 Edited to change "stamped" to "marked"
This 20-key Anglo has a lot in common with instruments made by Lachenal or "Tidder" (except for the note names being stamped on the reedpans) and you'd have no hesitation in thinking it had been made in England - until, that is, you noticed that it isn't stamped R and L in the ends, and isn't stamped with a serial number either. But the only markings (except for an Irish repairer's lable) are a pencilled 96 D and 96 B that give the game away - it must have been made in Germany! I had read the post you refer to and can see your logic, I did note that it was 2005, and I wondered if any more data had come to light.I also fully recognise your acknowledgement of Wes and indeed Chris' contributions to the quest. The instrument on e-bay has a lot of similarities to mine, which came to me in bits, and is still in bits, so it might be a good time to photograph salient features for record purposes. Do you want me email to you (separately) more 'hi-res photos? If so are there any particular features you would like to see? would you and Neil Wayne like photos for your online museum project? I had read the post you refer to and can see your logic, I did note that it was 2005, and I wondered if any more data had come to light. It was indeed 2005 Dave, and in the meantime I've lost a lot of data (photos, emails & research notes) when my PC got drowned a few years ago, but I'm also finding out more information now from sources that weren't available then - like last night, when I discovered (from William James Tidder's baptism record) that William Henry Tidder was already at 144, Jamaica Street in September 1873 - but he wasn't there at the time of the 1871 Census because I checked the entry for that address too, and I now know (as a result of that) that there are serious problems in reading the very faint census returns for the area in which he was probably living, which is quite likely why he is "missing" from the indexes.